Turn things ON (normally open) and/or OFF (normally closed) when activated, 40 amp current carrying capability. Relays allow you to switch heavy current on/off with delicate logic. The relay does the electrical "heavy lifting". For example, many logic timers can only switch 1 amp on/off. Most electric racing shifters require over 10 amps at the shift. Shifting the car without a relay would quickly burn up the timer by pulling too much current through it! The correct way to do this is to have the timer switch the relay on/off and the heavy duty contacts in the relay actually activate the shifter. Everything is happy! Example: The magneto tachometer we sell has a shift-light circuit that can switch up to 200mA (less than a quarter of one amp). Our electric lean-out valve requires 1.7 amps to open. You could use this relay with the tachometer, set the shift-light circuit to activate at a certain RPM and use it to turn your high-speed lean out on/off. The small 1" cube size makes it a great fit anywhere. Now, it's even easier to wire up with a socket! The relay plugs into the socket which is supplied with 4-1/2" pre-stripped, color-coded leads to allow quick connection to your vehicle. Use the pull-down menu above to purchase just the relay, just the socket or both the relay and socket together. 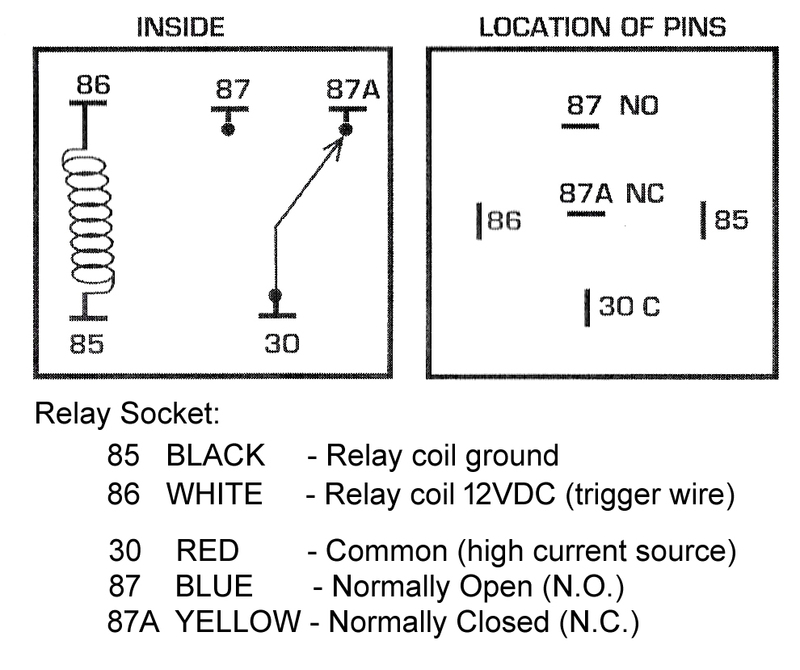 See the relay wiring schematic here.